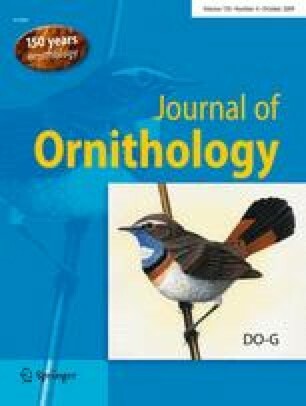 We provide evidence for cooperative breeding in two endemic parrot species of New Caledonia, the New Caledonian Parakeet (Cyanoramphus saisseti) and the Horned Parakeet (Eunymphicus cornutus). We intensively monitored 11 breeding attempts in two nests of New Caledonian Parakeets over 5 years, and noticed that two males of different size fed the female and the chicks in each nest. During one breeding attempt, the larger male guarded the female and the smaller male tried to copulate with her inside the nest. Genetic analyses showed that males shared paternity. During 17 breeding attempts in 11 Horned Parakeet nests, we observed two pairs sharing a nest on one occasion but we never saw feeding helpers. This study was part of the research project “Impact of introduced mammals and habitat loss on endemic birds of New Caledonia” done in cooperation with the Direction de l’Environnement (Province Sud, New Caledonia), which issued all permissions for this study, and financed by the Loro Parque Fundación (Spain), Polish Ministry of Science and Higher Education (grant 2P04F 001 29), Conservation des Espèces et Populations Animales (France), La Fondation Nature et Découvertes (France), Fonds für bedrohte Papageien—Zoologische Gesellschaft für Arten- und Populationsschutz (Germany), and a doctoral grant from Province Sud (to Sophie Rouys). We thank A. Lorenzo, the director of the Parc Zoologique et Forestier, for providing us with feather samples of captive parakeets; M. Broersen, C. Chatreau, P. de Pous, D. Dingemans, S. Duijns, A. Legault, B. Michielsen, E. Minnema, L. Nijdam, H. Theuerkauf, J. van Dijk, M. van Opijnen and J. Wardenaar for their help during field work; T. Greene for informing us about the location of a parakeet nest; and A. Cockburn, T.W.P. Friedl and anonymous reviewers for useful comments.